Elisabeth Grübl layers, stacks, orders and compresses—she puts loose material together in new ways until it finally stands in the room as a cuboid and in this form poses questions to those who look at it. For her work series Studio, under construction since 2007, Grübl takes over artists’ workshops and the objects she finds in them: art works, tools used for making art works, models of art works, models of rooms for exhibiting art works, chairs, tables, computers, monitors, books, bric-a-brac and treasures. 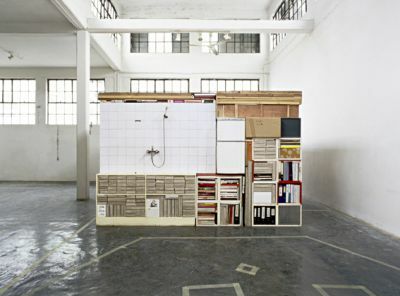 All the objects that help the host artist to meet his or her purpose are arranged by Grübl in a process of several days into a very present form in the room. She photographs this sculpture and turns it into her own work. Elisabeth Grübl is an installation and media artist. Her works entails indoor and outdoor installations, computer animations, interactive installations, object and concept art, photography, and she works with video, laser and sound. Read more about the artist in EIKON #86, 2014, 32—37 (author: Franz Thalmair).